Contactins mediate cell surface interactions during nervous system development. Participates in oligodendrocytes generation by acting as a ligand of NOTCH1. 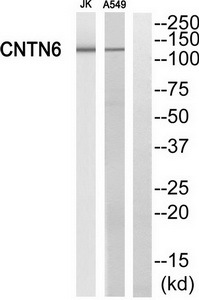 Its association with NOTCH1 promotes NOTCH1 activation through the released notch intracellular domain (NICD) and subsequent translocation to the nucleus. Involved in motor coordination . Cell membrane; Lipid-anchor › GPI-anchor.